Do you have a list of webpage URLs for which you’d like screencaps (aka screenshots)? Having screencaps of tweets can be useful for Twitter receipts, conducting a user study where you want to gauge folk’s reactions to seeing a tweet as it looked on Twitter.com (without needing to be online), or keep a folder of motivating tweets to refer to when you need encouragement. This post will help you also automate taking screencaps from a list of URLs, by pointing you two tutorials plus some advice on combining these. This tutorial is written from a Mac user’s perspective. Figuring out how many of our posts were amplified by a DH aggregator: For an external review of DH at UVA, we’re drafting a report on Scholars’ Lab as a DH unit. 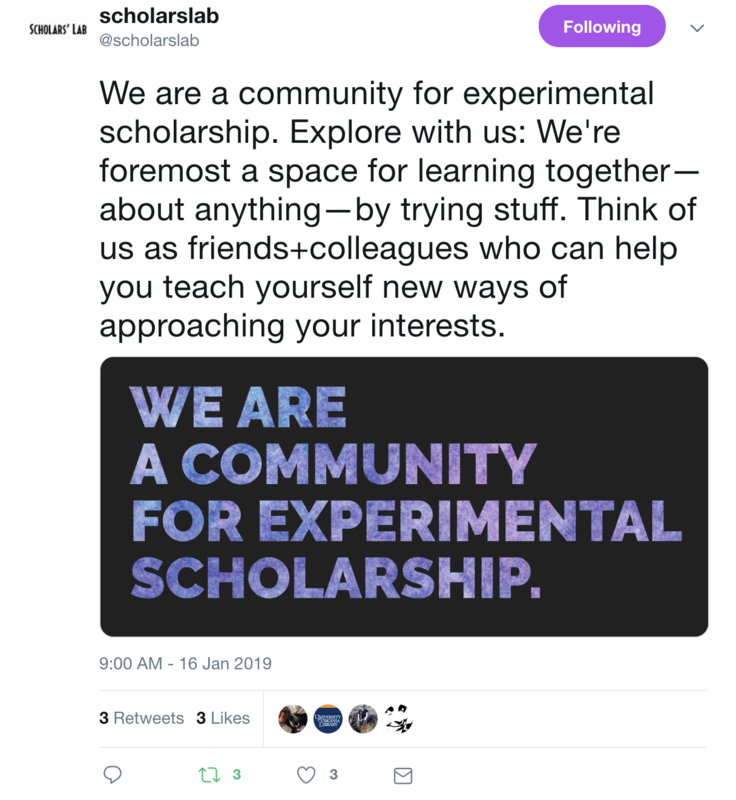 As a small part of this, I wanted to include the number of times SLab staff or students have had a blog post highlighted by Digital Humanities Now. Searching the DH Now with a variety of search terms (e.g. Praxis, Neatline, variants of “Scholars’ Lab”, names of former staff) turned up a bunch of posts, but without opening each result in a browser to skim that post, I couldn’t be sure that these were all actually either SLab-authored or citing SLab work (vs. e.g. happening to use the word “praxis”). By automating screencaps of all the links my search turned up, instead of opening each link in a browser, I could use Preview to bulk-open screencaps and glance over the top of each webpage, seeing more quickly whether a post was related to SLab or not. Joshua Johnson’s 2011 post “AppleScript: Automatically Create Screenshots from a List of Websites”. You may also wish to explore Documenting the Now’s tools for ethical preservation and research with social media, including the Tweet Catalogue to locate datasets of tweets using a given hashtag, and the Hydrator tool for turning those datasets back into a list of tweets and their metadata. If you want to create a list of just your faved tweets, see this tweet by Ryan Bauman tweet to get just the liked tweets from your Twitter > Settings > “Your Twitter Data” download. If you have a bunch of bookmarked URLs you want to screenshot (possibly in one bookmarks subfolder? ), you can export your whole set of bookmarks from the browser, then edit the resulting HTML file (using search+replace or regular expressions; sorry, that’s a whole separate lengthy tutorial, but Doug Knox’s tutorial here’s a good place to get started understanding regular expressions) to strip it to just a list of the URLs you want to screencap. 2. Next, we’ll use Joshua Johnson’s 2011 post “AppleScript: Automatically Create Screenshots from a List of Websites” to actually take the screencaps. We’re going to use the Mac “Script Editor” tool to tell our computer to take that list of URLs, open each in Safari, take a screencap of that screen, and save it. 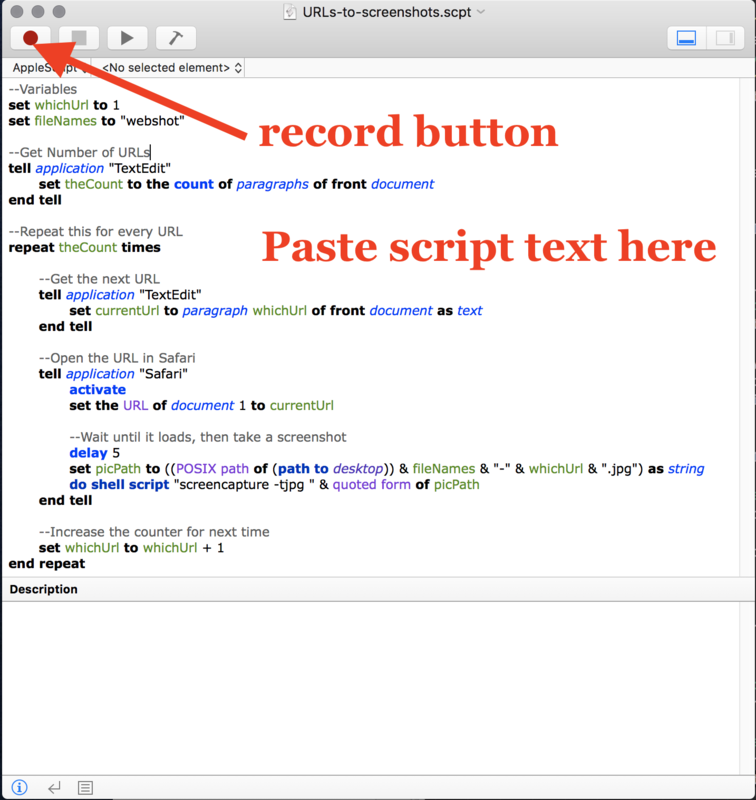 Open the Script Editor app (Applications > Utilities > Script Editor). If you have a slow internet connection or want to screencap pages on websites that load slowly, you may wish to find and adjust the piece of the script that says “delay 5”, to a larger number than 5 (this controls the time the script waits between directing safari to visit a given URL, and taking a screencap of whatever is then currently on the Safari screen). 4. Open the Applications > Safari browser, and drag its screen to be as large as possible. Depending on what level of zoomed-in/zoomed-out you usually use the Safari browser at, you may wish to adjust for the purpose of taking the screencaps; the screencaps will only capture what’s showing in the window you’ve opened (not stuff you’d need to scroll down to see). 5. Open the Applications > TextEdit app (not a different text editor, unless you want to figure out how to edit the script’s tell application "TextEdit" how to point to a different application). Paste in your list of URLs. If you have other TextEdit windows/tabs, make sure that the one with the URL list is the topmost/frontmost. When the script finishes running, you’ll have screencaps of all the URLs! Cite this post: Amanda Visconti. “Automating Webpage & Tweet Screencaptures”. Published January 30, 2019. https://scholarslab.lib.virginia.edu/blog/automating-webpage-tweet-screencaptures/. Accessed on .